Registrar of Voters Debbie Tebbetts announces information about the May 4 General Election. Polling places open at 7 a.m. and close at 8 p.m. There will one local issue on the ballot, a 10-year renewal of a $25 annual parcel fee continuation for Fire District 1. 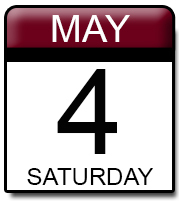 The last day to register to vote and/or make changes is Wednesday, April 3 by 4:30 p.m. (in person and by mail ) and Saturday, April 13 by 11:59 p.m. (online voter registration). Early voting will be conducted in the Registrar of Voters Office Saturday, April 20 and Monday, April 22-Saturday, April 27 from 8:30 a.m. until 6 p.m. Your written request must include: Voter’s name, voter’s Natchitoches Parish Address, voter’s date of birth, voter’s Social Security number or driver’s license number, reason the ballot is being requested, election date (May 4), address to mail the ballot to and voter’s signature. Mail and hand delivered ballots must be returned to the Registrar’s Office by 4:30 p.m. the day before the election. Military and overseas ballots must be returned to the Registrar’s Office before noon on election day. Call (318)357-2211 for more information.